Kimora features the classic hi-top with a fabulous twist. All over script screen print canvas. Metallic leather cat overlay on quarter panel and heel overlay. Synthetic lining. 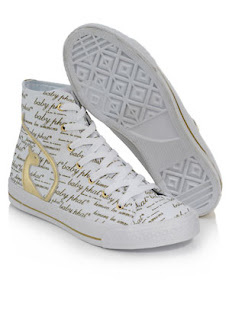 Script "baby phat" license plate on heel. Rubber outsole. White/Gold color. * Bought at Ebay for US$ 50.00 (brand new with box).